In an MLA session on "Links and Kinks in the Chain," the idea of the digital humanities as a kind of "Ministry of Silly Walks" was raised to illustrate the absurdity of attempting to group the idiosyncratic scholarly interests of a range of individuals into a single bureaucratic organization. In the discussion, Bethany Nowviskie also made a spirited defense of the importance of recognizing the labor of "hybrid scholars" who make important contributions to the digital humanities and embracing the spirit of "intellectual egalitarianism" in an honest conversation about status in the digital humanities. The line-up also included Laura C. Mandell, who is known for the range of her work from text-encoding initiatives to data visualizations, and Timothy B. Powell, whose work on Ojibwe culture I had seen earlier at the American Studies Association annual meeting. Much as Kim Christen has worked to keep cultural artifacts of her subjects in Aboriginal Australia off the public Internet, Powell has found himself questioning ideologies of openness promulgated by the digital humanities. Last up was Jason C. Rhody of the NEH Office of Digital Humanities, who discussed the challenges of overcoming the fiction of the solitary scholar and using both carrots and sticks to encourage people to collaborate on important initiatives like the Shakespeare folio project being undertaken by the Folger Library and a number of other institutional stakeholders. Rhody also discussed the importance of understanding that "infrastructure can be people" and not taking the contributions of librarians and computer scientists for granted. He cautioned that when it came to collaboration "2+2+2' might only add up to "3." In the question and answer session Jason B. Jones discussed how his own campus had experimented with giving all students an iPod touch as a vehicle for course content, but the problems that arose when students were separated from institutional infrastructures in their non-wireless homes. This was not the only session talking about the limitations and challenges of the digital humanities at the MLA. Earlier in the day in a session on "Making Research: Limits and Barriers in the Age of Digital Reproduction," other obstacles to utopian outcomes were also detailed. William Baker discussed "The History and Limitations of Digitalization" and grad student Elizabeth Vincelette pointed out how the hypertext party has been declared over by Alan Liu in a talk called "Moving Past the Hype of Hypertext: Limits of Scholarly Digital Ventures." Vincelette discussed how such projects might exploit the labor of graduate students, adjuncts, and OCR monitors and document scanners in developing nations. She singled out Google Book Search as a flawed privatized program that has been justifiably criticized by Geoffrey Nunberg and the issue of the theology surrounding Google that were first made explicit by Thomas Friedman. Graduate student and Tennyson scholar Jan Pridmore did not completely clarify the procedures in "A Proposed Model for Peer Review of Online Publications," but she did explain how her low budget, high quality site literaryhistory.com managed to produce so many pages and still avoid copyright battles with her large bibliographies of linked literary criticism. Pridmore singled out scholars like Marjorie Perloff for praise by putting so many of her scholarly essays online. On this morning panel only Kerry Kilner of AustLit played cheerleader. 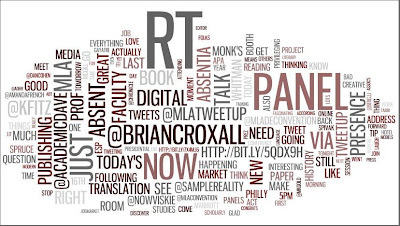 As the Twitter archive of tweets from the MLA indicates, there was a lively backchannel. One of the "rockstars" of the twitterati was the man who was called "missing in action" by the Chronicle of Higher Education: Brian Croxall. Croxall's name appears prominently in the Twitter wordcloud above and his blog entry explaining his absence for reasons of poverty became a must-read. Meanwhile, Twitter has also been a vehicle for the Twitter feed that complements the yearly MLAde send-up of Aaron Winter. Kathleen Fitzpatrick's round-up of all the digital humanities playfulness and caution at the MLA is here. Thanks to Mark Sample for the word cloud! Update: More great data visualizations about the MLA for Mark Sample here. I'm only a small piece of the pie!